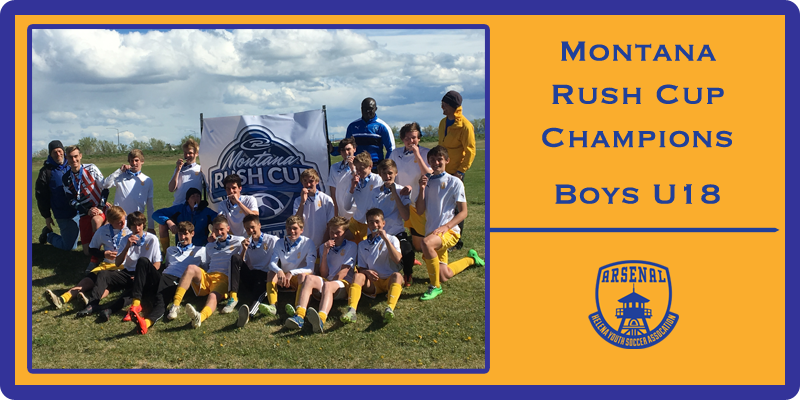 U18 Arsenal Boys team coached by Charly Ayidomihou, won the Montana Rush Cup tournament this past weekend. Helena came out on top of bracket play on Saturday. In their first game, Arsenal came back from a three goal deficit to tie Butte. Dawson Tedesco sparked the comeback with a shot from 30 yards out to score the first goal. Jackson Keller was able to follow that up with two additional goals. The first was scored off a penalty kick and the second by burying a rebounded shot that the Butte keeper was unable to secure. After that initial game, Helena outscored their opponents by an 11-1 margin. Colin McLean kicked off the scoring in Saturday’s second game against Laurel. Keller and Jacob Ries-Roncalli combined for two additional goals. Each getting an assist and a goal. Cameron Wilcox was able to shut down a strong striker for the Laurel team to help earn Gabe Studt the shut out in goal. In the semi-final game, Jacob Ries-Roncalli was able to bend a corner kick into the box against a stiff wind. The Great Falls players were unable to handle the kick and an own goal was the result. A few minutes later, Keller was able to add a security goal off a direct kick from Gavin Carlson. Carlson played the ball into the box and Keller was able to track the bounce after the keeper over ran the ball and volley it into the back of the net. In the Championship game, Helena came out ready to play. Aiden Adamek and Keller worked the ball down the right side and scored within the first minute. Adamek picked up his second assist three minutes later when Connor Bartleson scored the second goal. Ries-Roncalli later crossed the ball into the box and Keller was able to put it in for the third goal before halftime. Harrison Dengel and Keller combined for the next two goals. Late in the game, Ryan Quinn provided the assist to Ben Ries-Roncalli for the final goal. The Arsenal squad sends thanks and healing thoughts to the Butte team. Butte players suffered several injuries Sunday but still played hard until the final whistle.